1The authors are with the Department of EECS, Nagoya University, Furo-cho, Chikusa-ku Nagoya, Japan (e-mail: sato@nuee.nagoya-u.ac.jp). The transport network paradigm is moving toward next-generation networks that aim at IP convergence, while architectures and technologies are diversifying. Video technologies including ultrahigh-definition TV (more than 33M pixels) continue to advance, and future communication networks will become video-centric. The inefficiencies of current IP technologies, in particular, the energy consumption and throughput limitations of IP routers, will become pressing problems. Harnessing the full power of light will resolve these problems and spur the creation of future video-centric networks. Extension of optical layer technologies and coordination with new transport protocols will be critical; hierarchical optical path technologies and optical circuit/path switching will play key roles. Recent technical advances in these fields are presented. K. Sato, S. Okamoto, H. Hadama, “Optical path layer technologies to enhance B-ISDN integrity,” in IEEE Int. Conf. Communications, 1993. ICC 93. Geneva. Technical Program, Conf. Rec., Geneva, Switzerland, May 23–26, 1993, vol. 3, no. 3, pp. 1300–1307. K. Sato, S. Okamoto, H. Hadama, “Network integrity enhancement with optical path layer technologies,” IEEE J. Sel. Areas Commun., vol. 12, no. 1, pp. 159–170, Jan. 1994. H. Tsushima, Y. Fukahiro, “OTN-based optical cross-connect systems to create reliable and transparent optical networks,” Proc. SPIE, vol. 6012, paper 601208, Oct. 2005. K. Kubota, “Beyond HDTV—ultra high-definition television system,” presented at 2nd Multimedia Conf. 2006, London, Nov. 29–30, 2006. M. Tanimoto, “FTV (free viewpoint TV) and creation of ray-based image engineering,” ECTI Trans. Electr. Eng., Electron. Commun. vol. 6, no. 1, pp. 3–14, Feb. 2008. J. Baliga, K. Hinton, R. S. Tucker, “Energy consumption of the Internet,” presented at Joint Int. Conf. on Optical Internet, 2007 and the 2007 32nd Australian Conf. on Optical Fibre Technology. COIN-ACOFT 2007., Melbourne, Australia, July 24–27, 2007, paper WeA1-1. K. Hinton, P. M. Farrell, R. S. Tucker, “The photonic bottleneck,” in Optical Fiber Communication Conf. and Expo. and The Nat. Fiber Optic Engineers Conf., Anaheim, CA, March, 25–29, 2007, OSA Technical Digest Series (CD), Washington, DC: Optical Society of America, 2007, paper OThI1. K. Sato, “Recent developments in and challenges of photonic networking technologies,” in IEICE Trans. Commun., vol. E90-B, no. 3, pp. 454–467, March 2007. K. Sato, H. Hasegawa, “Prospects and challenges of multi-layer optical networks,” IEICE Trans. Commun., vol. E90-B, no. 8, pp. 1890–1902, Aug. 2007. R. Tucker, “Optical packet-switched WDM networks: a cost and energy perspective,” in Optical Fiber Communication Conf. and Expo. and The Nat. Fiber Optic Engineers Conf., San Diego, CA, February 2008, OSA Technical Digest (CD), Washington, DC: Optical Society of America, 2008, paper OMG1. ITU Symposia on ICTs and Climate Change, Kyoto, Japan, Apr. 15–16, 2008. ITU Symposia on ICTs and Climate Change, London, June 17–18, 2008. S. Torigoe, “R&D approaches to power saving at NTT,” NTT R&D Forum 2008 Workshop, Feb. 8, 2008. A. Gladisch, C. Lange, R. Leppla, “Power efficiency of optical versus electronic access networks,” presented at ECOC 2008 Symp. Network Solutions to Reduce the Energy Footprint of ICT, Brussels, Sept. 21, 2008. F. Cucchietti, “Energy efficiency—an enabler for the next generation network,” Bruxelles, Belgium, Jan. 30, 2006. A. Ogasawara, “Energy issues confronting the information and communications sector,” Sci. Technol. Trends vol. 2, pp. 32–41, 2006. ITU-T Recommendation Y.2001, “Next Generation Networks—Frameworks and functional architecture models,” December 2004. “Network performance objectives for IP-based services,” ITU-T Recommendation Y.1541, Feb. 2006. P. Ghiggino, “NG fiber in access—can optical technology rise to the challenge?” presented at 2007 Japan–Italy Bilateral Workshop on Photonics for Communication, Osaka, Japan, July 5–6, 2007. Digital Cinema Initiatives LLC, Digital Cinema System Specification, v. 1.2, March 2008. “Parameter values for an expanded hierarchy of LSDI image formats for production and international program exchange,” ITU-R Recommendation BT.1769, 2006. K. Harada, K. Shimizu, T. Kudou, T. Ozeki, “Hierarchical optical path cross-connect systems for large scale WDM networks,” in Optical Fiber Communication Conf., 1999, and Int. Conf. Integrated Optics and Optical Fiber Communication. OFC/IOOC, San Diego, CA, Feb. 21–26, 1999, vol. 2, pp. 356–358. L. Noirie, C. Blaizot, E. Dotaro, “Multi-granularity optical cross-connect,” in Proc. European Conf. Optical Communication (ECOC), Oct. 2000, pp. 269–270. R. Parthiban, R. S. Tucker, C. Leckie, “Waveband grooming and IP aggregation in optical networks,” J. Lightwave Technol., vol. 21, no. 11, pp. 2476–2488, Nov. 2003. X. Cao, V. Anand, C. Qiao, “Waveband switching in optical networks,” IEEE Trans. Commun. vol. 41, pp. 105–112, Apr. 2003. B. Mukherjee, C. Ou, Zhu Hongyue, Zhu Keyao, N. Singhal, Y. Shun, “Traffic grooming in mesh optical networks,” in Optical Fiber Communication Conf., Los Angeles, CA, Feb. 22, 2004, Technical Digest (CD), Washington, DC: Optical Society of America, 2004, paper ThG1. D. C. Lee, “100 G and DWDM: application climate, network and service architecture,” in Optical Fiber Communication Conf. and Expo. and The Nat. Fiber Optic Engineers Conf., San Diego, CA, Feb. 24, 2008, OSA Technical Digest (CD), Washington, DC: Optical Society of America, 2008, paper OThB1. S. Beckett, M. A. Lazer, “Optical mesh service—service strategy capitalizing on industry trends,” presented at OIF Workshop—ASON/GMPLS Implementations in Carrier Networks, Dallas, TX, Oct. 16, 2006. S. Liu, L. Chen, “Deployment of carrier-grade bandwidth-on-demand services over optical transport networks: a Verizon experience,” in Nat. Fiber Optic Engineers Conf., Anaheim, CA, March 25–29, 2007, OSA Technical Digest Series (CD), Washington, DC: Optical Society of America, 2007, paper NThC3. D. Ward and M. Betts, ed., “MPLS architectural considerations for a transport profile,” Apr. 18, 2008, http://www.ietf.org/MPLS-TP_overview-22.pdf. “Specifications of signaling system No. 7,” ITU-T Recommendation Q.700, March 1993. I. Yagyu, H. Hasegawa, K. Sato, “An efficient optical path network design algorithm based on a traffic demand expression in a Cartesian product space,” in Eur. Conf. Optical Communication (ECOC 2006), Cannes, France, Sept. 24–28, 2006, paper Tu.3.6.6. S. Kakehashi, H. Hasegawa, K. Sato, O. Moriwaki, S. Kamei, “Optical cross-connect switch architectures for hierarchical optical path networks,” IEICE Trans. Commun. vol. E91-B, no. 10, pp. 3174–3184, Oct. 2008. K. Sato, S. Okamoto, H. Hadama, “Optical path layer technologies to enhance B-ISDN performance,” in IEEE Int. Conf. Communications, 1993. ICC 93. Geneva. Technical Program, Conf. Rec., Geneva, Switzerland, May 23–26, 1993, vol. 3, pp. 1300–1307. S. Okamoto, A. Watanabe, K. Sato, “A new optical path cross-connect system architecture utilizing delivery and coupling matrix switch,” IEICE Trans. Commun. vol. E77-B, no. 10, pp. 1272–1274, Oct. 1994. K. Sato, Advances in Transport Network Technologies: Photonic Networks ATM, and SDH, Norwood, CT: Artech House, 1996. K. Sato, “Prospects and challenges of photonic IP networks,” Proc. SPIE, vol. 5626, pp. 382–390, 2005. S. Mitsui, H. Hasegawa, K. Sato, “Hierarchical optical path cross-connect node architecture using WSS/WBSS,” in Int. Conf. on Photonics in Switching 2008, PS 2008, Sapporo, Japan, Aug. 4–7, 2008, paper S-04-1. P.-H. Ho, H. T. Mouftah, J. Wu, “A scalable design of multigranularity optical cross-connects for the next-generation optical internet,” IEEE J. Sel. Areas Commun.vol. 21, pp. 1133–1142, Sep. 2003. A. Kolarov, T. Wang, B. Sengupta, M. Cvijetic, “Impact of waveband switching on dimensioning multi-granular hybrid optical networks,” in Conf. on Optical Network Design and Modeling 2005, Milan, Italy, Feb. 7–9, 2005, pp. 371–381. Y. Shun, C. Ou, B. Mukherjee, “Design of hybrid optical networks with waveband and electrical TDM switching,” in IEEE Global Telecommunications Conf. 2003. GLOBECOM ’03., Dec. 1–5, 2003, vol. 5, pp. 2803–2808. S. S. W. Lee, M. C. Yuang, P.-L. Tien, “A Lagrangean relaxation approach to routing and wavelength assignment for multi-granularity optical WDM networks,” in IEEE Global Telecommunications Conf. 2004. GLOBECOM ’04, 29 Nov. 29–Dec. 3, 2004, vol. 3, pp. 1936–1942. P.-H. Ho, H. T. Mouftah, “Routing and wavelength assignment with multigranularity traffic in optical networks,” IEEE J. Lightwave Technol. vol. 20, no. 8, pp. 1292–1303, Aug. 2002. M. Lee, J. Yu, Y. Kim, C. Kang, J. Park, “Design of hierarchical crossconnect WDM networks employing a two-stage multiplexing scheme of waveband and wavelength,” IEEE J. Sel. Areas Commun.vol. 20, pp. 166–171, Jan. 2002. X. Cao, V. Anand, Y. Xiong, C. Qiao, “A study of waveband switching with multilayer multigranular optical crossconnects,” IEEE J. Sel. Areas Commun.vol. 21, pp. 1081–1094, Sep. 2003. I. Yagyu, H. Hasegawa, K. Sato, “An efficient hierarchical optical path network design algorithm based on traffic demand expression in a Cartesian produce space,” IEEE J. Sel. 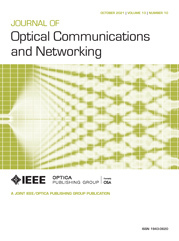 Areas Commun., Supplement on Optical Communications and Networking (OCN), vol. 26, no. 6, Aug. 2008, pp. 22–31. S. Varma, J. P. Jue, “Protection in multi-granular waveband networks,” in IEEE Global Telecommunications Conf. 2004. GLOBECOM ’04, Nov. 29–Dec. 3, 2004, vol. 3, pp. 1759–1763. Y. Yamada, H. Hasegawa, K. Sato, “Hierarchical optical path network design considering waveband protection,” in 33rd European Conf. and Exhibition on Optical Communication—ECOC 2007, Berlin, Germany, Sept. 16–20, 2007, vol. 3, pp. 189–190. Y. Yamada, H. Hasegawa, K. Sato, “Cost comparisons for hierarchical and single-layer optical path networks considering waveband and wavelength path protection,” in Optical Fiber Communication Conf. and Expo. and Nat. Fiber Optic Engineers Conf., San Diego, Feb. 2008, OSA Technical Digest (CD), Washington, DC: Optical Society of America, 2008, paper OThI4. E. Mannie, ed., “Generalized multi-protocol label switching (GMPLS) architecture,” The Internet Society, Network Working Group Request for Comments 3945, Oct. 2004. M. Okada, H. Hasegawa, K. Sato, “Development of design and administration system for GMPLS-controlled large scale hierarchical optical path networks,” in IEICE Society Conf. 2008, Tokyo, Japan, September 16–19, 2008, paper B-7-66. S. Kakehashi, H. Hasegawa, K. Sato, O. Moriwaki, “Waveband mux–demux using concatenated arrayed-waveguide gratings,” in Proc. European Conf. on Optical Communication, ECOC 2006, Cannes, France, Sept. 24–28, 2006, paper We3.P.56. S. Kakehashi, H. Hasegawa, K.-i. Sato, O. Moriwaki, S. Kamei, “Analysis and development of fixed and variable waveband mux–demux utilizing AWG routing functions,” J. Lightwave Technol., vol. 27, no. 1, pp. 30–40, Jan. 2009. S. Kakehashi, H. Hasegawa, O. Moriwaki, M. Okuno, “Waveband selective switch using concatenated AWGs,” in Proc. European Conf. on Optical Communication, ECOC 2007, Berlin, Germany, Sept. 16–29, 2007, paper Mo.2.5.3. H. Takahashi, K. Oda, H. Toba, Y. Inoue, “Transmission characteristics of arrayed waveguide N×N wavelength multiplexer,” J. Lightwave Technol.vol. 13, no. 3, March 1995, pp. 447–455. Fig. 1 Consumption of electricity by telecommunication carrier in Japan. Fig. 2 Price per bit and upper bound of packet loss for various services. Fig. 3 Trend in router throughput and traffic increase. Fig. 4 Evolution in transmission speed for core or metro networks and that for LAN. Fig. 5 Wavelength path and WB path, and hierarchical optical cross-connect configuration. Fig. 6 Comparison of single-layer optical path network and hierarchical optical path network. Fig. 7 Effectiveness of WBs and network size dependency. Fig. 8 Comparison of single-layer and hierarchical optical path cross-connect switch scale. Fig. 9 Comparison of single and hierarchical optical path cross-switch scale. Fig. 10 Network cost reduction attained with introducing WB technologies. Fig. 11 Cost comparisons between optical path protected networks and WB path protected networks. Fig. 12 Different WB arrangements. Fig. 13 Generic architecture of WBSS and an example of 1 × 3 WBSS that can be realized with two AWGs and four 1 × 3 optical switches. Fig. 14 Prototype 1 × 5 WBSS fabricated with PLC technology; two chips were connected by fibers. Fig. 15 WBSS for interleaved channel allocation constructed with cyclic AWGs.